I really enjoy sharing some of my favorite things with you! 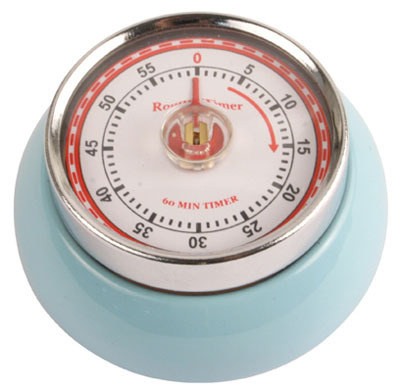 I just love this retro kitchen timer by Kikkerland. After reading many reviews on this particular item, I was a bit scared off. So, I asked two ‘Streamers whom I knew owned one, Monica B. from Just 5 More Minutes and Laura D. from Riveted. What I realized after getting rave reviews from my friends is that if you don’t wind the timer all the way around first, the timer won’t work hence some less favorable reviews. Think of it as winding a clock ~ you simply turn the silver rim of the timer clockwise all the way around then go back counter-clockwise to set to your desired time. It works perfectly ever time. I purchased my “Red” Kikkerland Kitchen Timer in Fredericksburg, Texas at Red which is a very hip and retro store worthy of checking out. Or you can purchase it here. The timer comes in several cool colors. Enjoy!